BC Forest Discovery Centre: Spotlight on No. 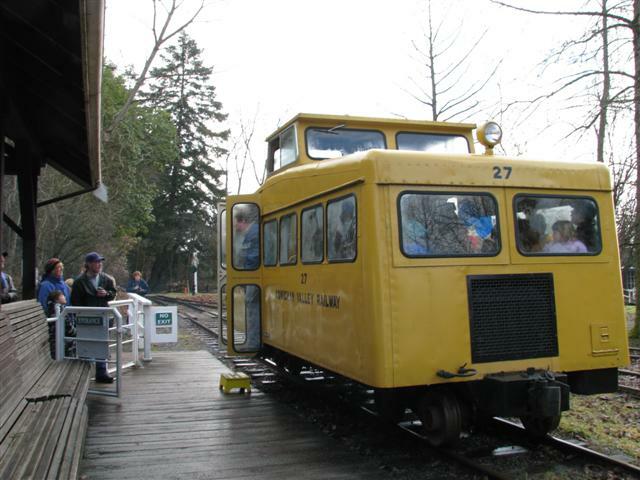 27 "Handy Andy"
No.27, or "Handy Andy" as we like to call him, is operational and supplements the passenger train on busy days during the open season and transports special groups during the off season. The enclosed car is a replica speeder and would have been used in a logging camp to transfer loggers between the camp and the logging show (where the work was taking place). Description: 8-wheel, model “Handy Andy” crew speeder. Current engine: Ford 360 cu in V-8. CVR No.27 was speeder No.6 on the BCER Jordan River railway. Records show it was a Westminster Iron Works “Handy Andy” design built to BCER specifications. Following closure of the railway, it came to be owned by Crown Zellerbach, likely acquired specifically for donation to the (then) Cowichan Valley Forest Museum. After a re-work at the BC Forest Service Maintenance Depot, at which time it was converted from 4 to 8 wheels, it was donated in July of 1974. This speeder is typical of those used in the later years of railway logging to transport workers and materials to and from job sites. In the case of the more remote camps, they also transported workers and their families between camp and town. Capable of speeds of up to 45 miles per hour, they were much faster and more comfortable than hitching a ride with the usually slow moving log trains. Many logging speeders were built to Department of Railway standards at the company repair shop, by the camp master mechanic. While most service was as a railway bus (crummy) and ambulance, some also worked as light locomotives.